A hub for 40 years, kosher Grand Bakery reaches out – J.
Moti Dagan had never baked a black-and-white cookie, but the Israeli chef had seen one on TV — when Jerry Seinfeld held the saucer-sized, two-toned confection up to the camera and called it "the perfect cookie." Approached by Bob Jaffe, a New Jersey native who pined for a black-and-white like the ones he used to nosh as a child, the pair rented space at Oakland's kosher Grand Bakery and worked on developing the perfect "perfect cookie" at 3 a.m. The cookies sold like hotcakes. Well enough, in fact, that, almost three years ago, Dagan and Jaffe quit working the vampire schedule and bought the Grand Bakery, taking over the 40-year-old neighborhood landmark. Today the shop offers not only baked goods, but soups, sandwiches and Mediterranean specialties, plus a couple of tables where regulars hang out for lunch or coffee breaks. "You go in there thinking you'll just walk in and out, but a half-an-hour later you realize you're still in there because you'll bump into everybody in the Jewish community," said Leslie Klonoff, a member of nearby Beth Jacob Congregation and an avowed Grand Bakery aficionado. "The bakery is definitely the glue that holds the Jewish community together here in the East Bay." 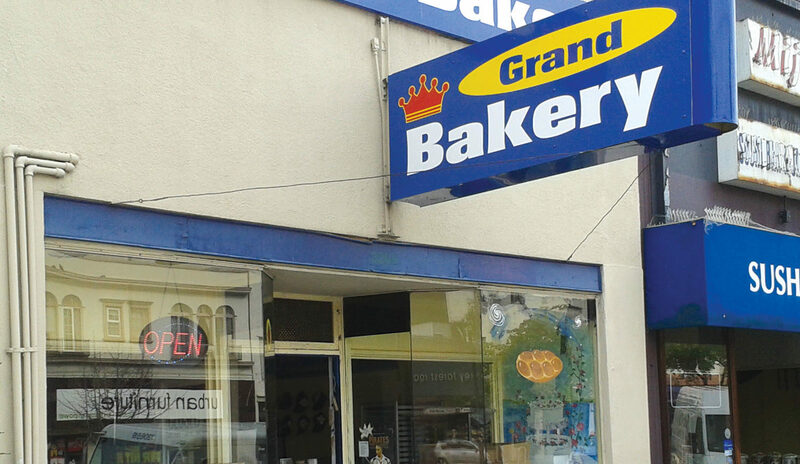 After four decades on Grand Avenue, some things haven't changed a lick at the bakery. The huge stove roughly the same size and shape as a Volkswagen bus is the very same one where Ernie Hollander baked his first strudel when he opened shop 40 years ago. Yet the proliferation of Grand Bakery products popping up in local grocery stores — well, that's new. In addition, the bakery is now certified by the Vaad Hakashrus of Northern California, meeting strict Orthodox standards. Watching the lines stretch out the door and onto Grand Avenue every Friday morning — not to mention around the High Holy Days — Jaffe decided the time was ripe for a little expansion. Grand Bakery's Russian tea cookies, challahs, macaroons and cakes are now available at more than 20 local markets, including the Mollie Stone's chain, Andronico's, Diablo Foods and the Piedmont Market in Oakland. Jaffe, who handles much of the business side and also decorates cakes, isn't worried that the markets will siphon off customers. "I have 100 products in my store, but the other stores only sell 10 of them. People will still come into my store." Jaffe and Dagan's success was not to be for Hollander, the paterfamilias of Grand Bakery, who founded what he called The New Yorker Bakery with his wife, Anna, in 1961. The Hollanders, both transplanted New Yorkers and Czech Holocaust survivors, crafted exotic, wondrous confections like Hungarian strudel. But they had a marketing problem. Anna Hollander jokes that when she and her husband moved to Oakland, the city's kosher population doubled. Her husband chimed in: "Well, when I was running it, there were not enough Jewish people here to buy Jewish cakes. 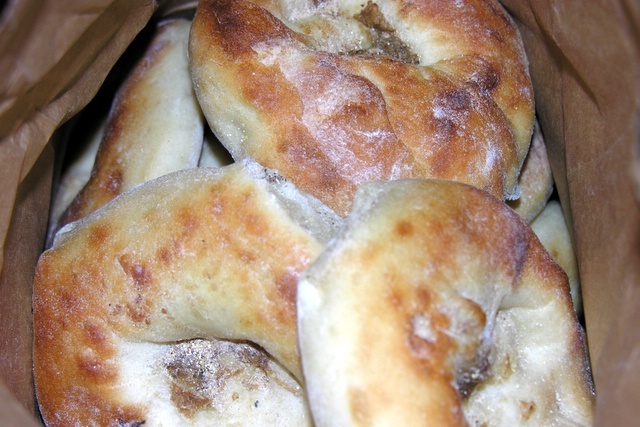 I came from New York and set up the first kosher bakery in Oakland; I thought I'd make a fortune. It didn't turn out like that," recalled the 76-year-old who, along with his wife, belongs to the Orthodox Beth Jacob and is a bakery patron. "I remember, the first day I opened up, the rabbi from Beth Jacob said, 'Look, we're an Orthodox synagogue and we have no money. Can you supply us for free?' Then it was the old-age home [Oakland's Home for Jewish Parents], and we gave them free pastries. Then Beth Abraham came, Sinai, every synagogue, Hadassah. More than half the baking I did daily, I gave away for free. I couldn't say no. My wife always says that if I was a woman I'd be pregnant every nine months — I can't say no." Hollander sold his bakery in the mid-'60s to Ernie Feld, who renamed it Ernie's Strudel Palace. Sometime between then and now, the shop was emblazoned with its present moniker. Hollander — who has since prospered in the junk business — points out that since his baking days, many more observant Jews now live in Oakland, and the Grand is the East Bay's sole kosher bakery. But, he adds, necessity is not the only reason the shop is so popular. "[Dagan] is a very good baker. He makes very nice cakes, challahs and pastries. I am diabetic, so I don't eat cake any more. But my son loves cake, so I always have a cake or two around the house." It is also, like TV's "Cheers!" a place where everybody knows your name. "Sometimes on Friday, it feels like a family gathering," said Dagan. "I like it here; it is the best place to work. 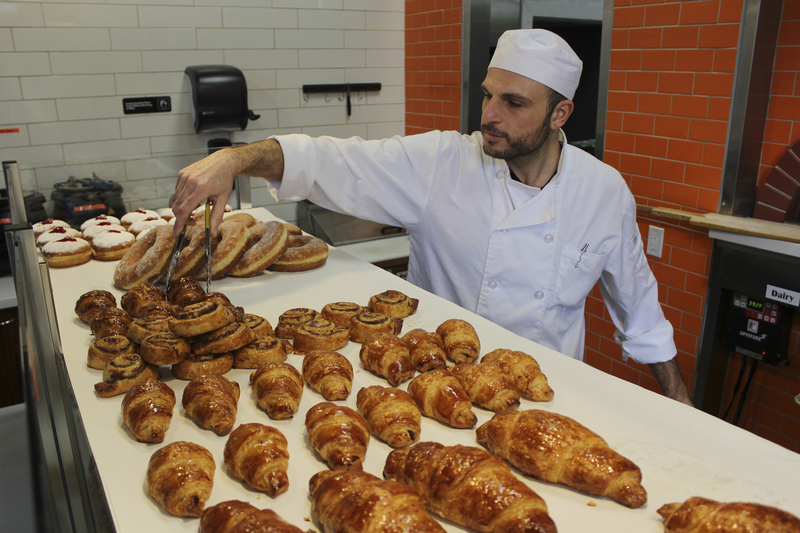 I'm so happy to work here in the bakery — but I'm happier to own it."